We were in Alaska for three days before we finally saw a moose. I write “finally” because the evidence of moose was all around us. Moose ate my Aunt Joanne’s lilac buds, so this June as everyone’s lilacs are blooming, hers remain flower-free. As we were walking beside McHugh Creek, the saplings by the trail were neatly snipped off and moose droppings were everywhere. (Ed thought they looked like chocolate Easter eggs, and advised the girls not to eat them.) With all this evidence, we thought we would see one fairly soon. 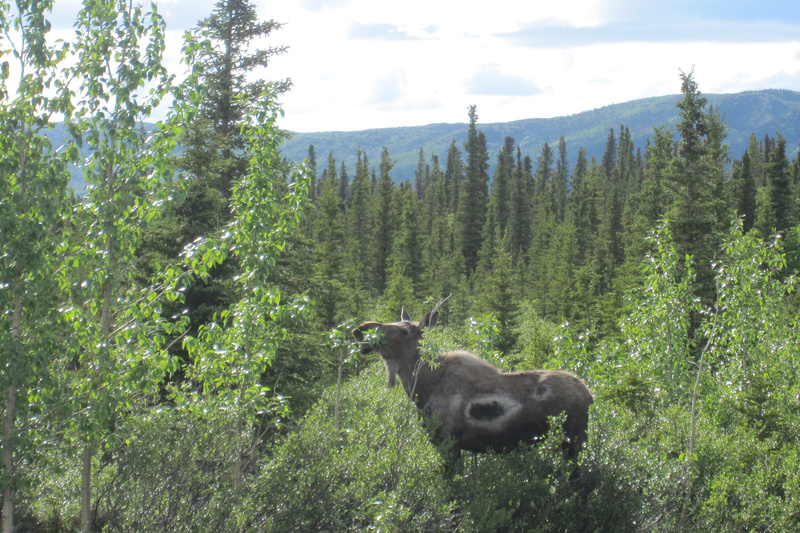 As with most animal sightings, seeing our first moose happened when we least expected it. We were driving in a wooded area with suddenly Ed slowed down and stopped for the cow and calf that were right in front of us on the road. The mama moose gracefully stepped over the guard railing with her lanky legs. Her calf hesitated, then followed right behind her. But with those shorter baby legs the calf was rather clumsy in making such big steps. 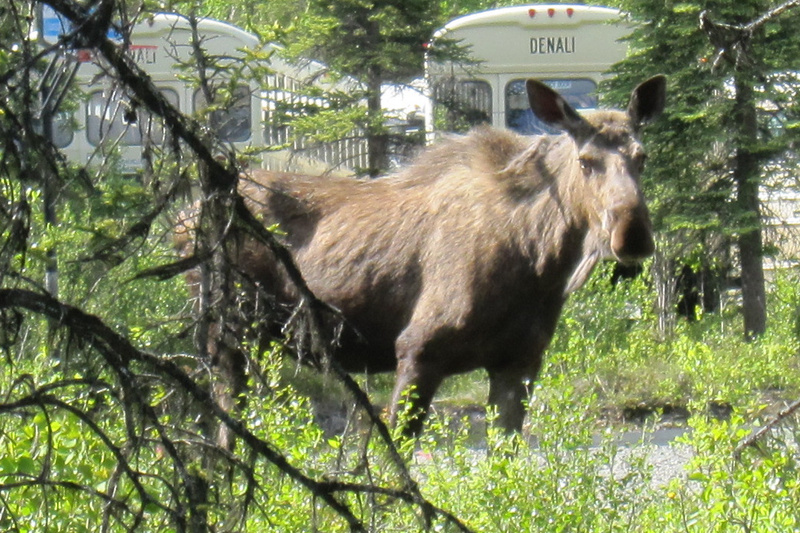 Just to prove that there really are a lot of moose in Alaska, they started showing up around every corner. Emmy spotted the next one, just a few feet away from us. 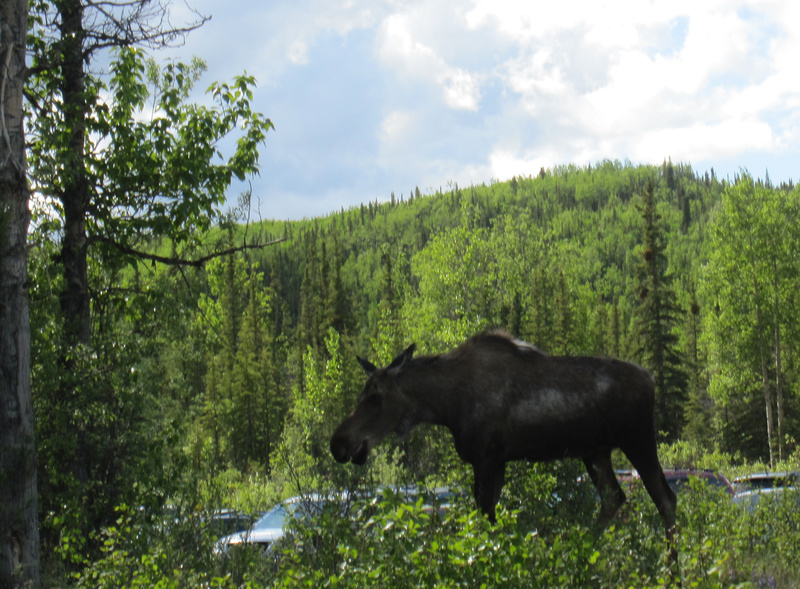 We had barely gotten out of the parking lot in Denali National Park. A moose just feet away from us on the trail. Just a short time later, another moose was in front of the Visitor’s Center as we were making our way back to the car. And as we drove back to our hotel that evening, a moose was on the side of the road. 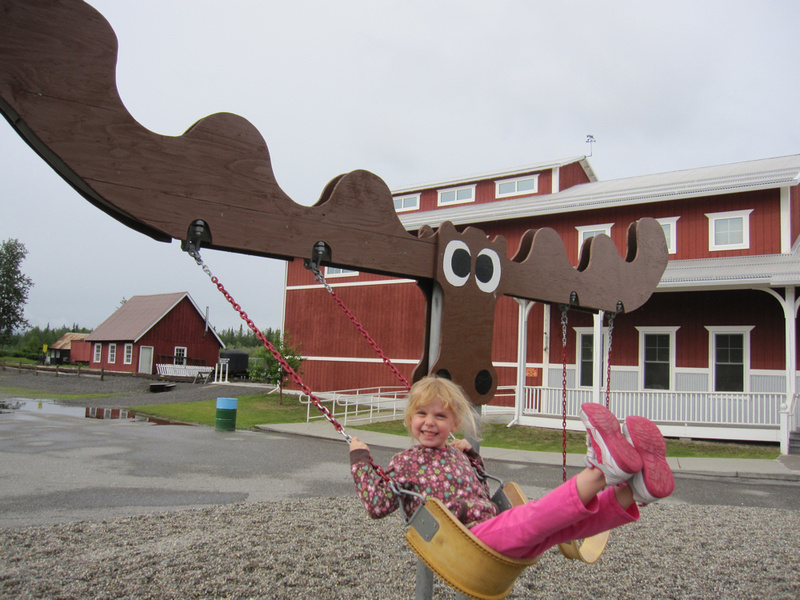 A moose even showed up at the playground! Chocolate mousse is my favorite kind of moose! Haha! Great pictures. Looks like you guys are having fun! Cute swing. 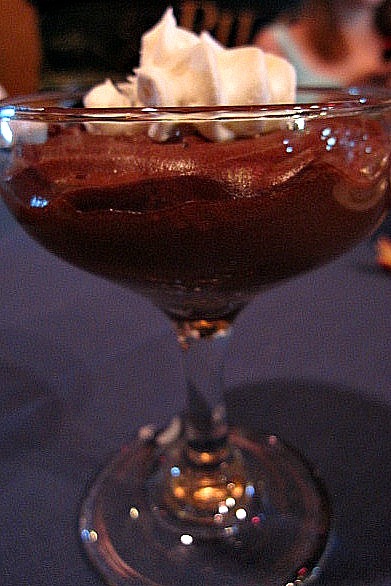 Mmm – chocolate mousse. That is so cool! So glad you saw them and the swing set is also cute. Chocolate Moose is yummy, but the animal ones are oddly cute! Wow, Alaska seems like such a fascinating, beautiful place. Sounds like you are having a wonderful time! My recent post Certainty…in Uncertainty??? What a neat thing to see! Hope your having fun!